This PDF 1.5 document has been generated by Microsoft® Word 2013, and has been sent on pdf-archive.com on 04/07/2014 at 08:03, from IP address 117.211.x.x. The current document download page has been viewed 435 times. File size: 635 KB (8 pages). M.E. Student in Comp. Deptt, VP COE, Baramati. Pune University. KEYWORD: Shadow Detection, Shadow Removal, Image enhancement, Image restoration. (VHR) image. Such as vehicles, road, different shape of buildings, land marks etc. as well as shadow. For such kind image we required new change detection, analysis and classification techniques. images in very short time help to take crucial and rapid action in rescue mission . successive thresholding scheme , different color space is analyzed to detect shadow. effects. This method is base on spectral signature of the spectral bands. experimental results, Section V draws the conclusions, and section VI contains future work. Shadow detection and removal from image related work as followed. representation of the image, and then re-integrating the edge using the method introduced by Weiss. requires neither a calibrated camera nor multiple images. recovery, They are able to arrive at our sought after full color, shadow free image. image. This paper works on recover that information. non shadow part. Apply this difference on shadow pixel and we get reconstructed shadow less image. Figure 2:- Flow chart of proposed method. length (l). Finally we get grayscale image. features, we can classify image into shadow vs. nonshadow classification. two steps, namely edge detection followed by image imposing. for pixel (x, y) by using equation (2). which is clear edges of shadow and nonshadow part and second image is binary converted image. Apply image imposing on these two images and output is shadow detected region with clear edges. first step, we calculate mean and standard deviation for shadow and nonshadow region respectively. 3.3.1 Calculate Mean and Standard Deviation. distance from the origin in the horizontal axis, y is the distance from the origin in the vertical axis. using equation no (4) and (5) respectively. deviation for shadow and nonshadow region of image. (D) between shadow and non shadow part by using equation (9). of standard deviation. Finally we got shadow free image. finally resulted image (e), which is shadow free image. Intermediate image. (e) Resulted image. 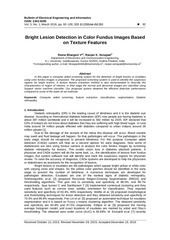 algorithm and then apply image imposing process on binary image with canny edge detected image. person gave us something too light my pathway, I thanks for believing in me. Removal,&quot; EUROGRAPHICS 2008 Volume 27 (2008), Number 2.
sensing, Manuscript received February 22, 2011.
state-of-the-art superpixel methods”. IEEE TPAMI, 2012. Graham D. Finlayson, Steven D. Hordley, and Mark S. Drew, &quot;Removing Shadows from Images,&quot;. Recent Methods.”Pattern Recognition, Vol. 45, No. 4, pp. 1684–1695, 2012.
images,” IEEE Trans. Geosci. Remote Sens., vol. 45, no. 6, pp. 1650–1657, Jun. 2007. Color Imag. Conf., 2002, vol. 10, pp. 343–348. vol. SMC-9, no. 1, pp. 62–66, Jan. 1979.
successive thresholding scheme,” IEEE Trans. Geosci. Remote Sens., vol. 47, no. 2, pp. 671–682, Feb.
sensed color images,” in Proc. 8th Int. Conf. Signal Process., Nov. 2006, vol. 2, pp. 1–4. sensing imagery,” in Proc. IEEE IGARSS, Jul. 2009, vol. 4, pp. 426–429. Professor in Dept of Information Technology of SVPM’s COE, Malegaon, Pune University. His research interests lies in Digital Image Processing. This file has been shared by a user of PDF Archive. Document ID: 00172354.